Comme Ca is loud, noisy and very busy. There are two ways to handle the problem on a Saturday night – go early or go late. We have chosen to go early. The staff has the time to really talk to you, the room is beautiful with the sun just beginning to set, the vibe is fun without being frenetic and the entire experience is just pleasurable. If we lived closer, we would definitely go on a weekday, but traffic has become unbearable in Los Angeles and a 30 minute drive can become 2 hours so Saturday night early has become our way of handling the situation. Comme Ca excels at service. Each and every member of the service team is extraordinary; from Max, the hostess to Ashley our waitress to Jason, the sommelier, to Ako, the new GM and finally Dominic, ex-GM, who is about to follow other pursuits. The kitchen was spot on last night. Each dish was done perfectly – not one miss. Amuse presented by Patrick, the wonderful cheese person. 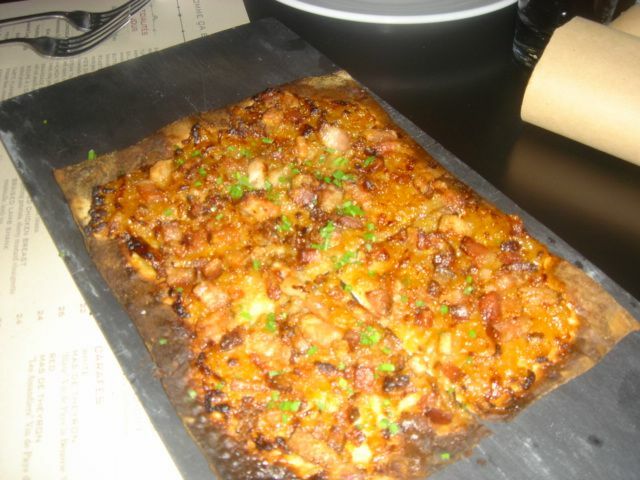 Tarte Flambee, fromage blanc, caramelized onions, lardons – We have had this each time at Comme Ca, but last night’s version was absolutely fantastic – the caramelized onions were melt in your mouth perfect and the lardons just crispy and wonderful. Only half of the tart is pictured. 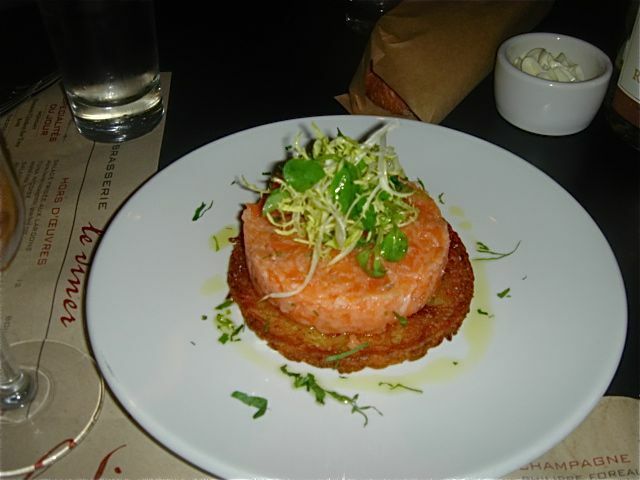 Salmon tartar, lemon, crisp potato – this has replaced the smoked salmon galette and is an excellent version of tartar – lightly dressed and not drowning in oil. 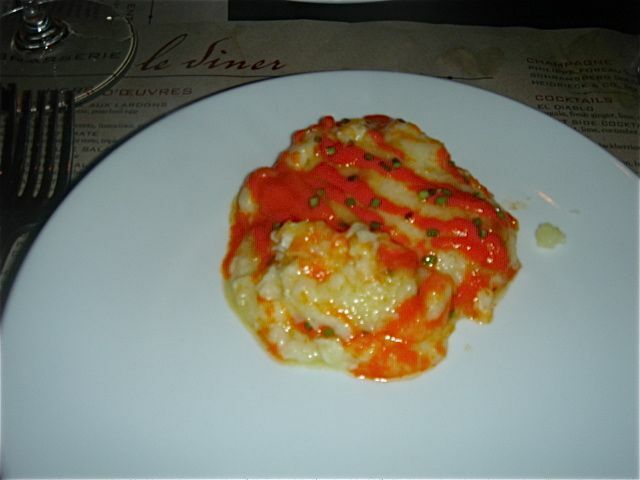 Brandade de Morue Gratinee – salt cod, piquillo pepper puree – again we have had this every time at Comme Ca, but last night’s version was the best yet. 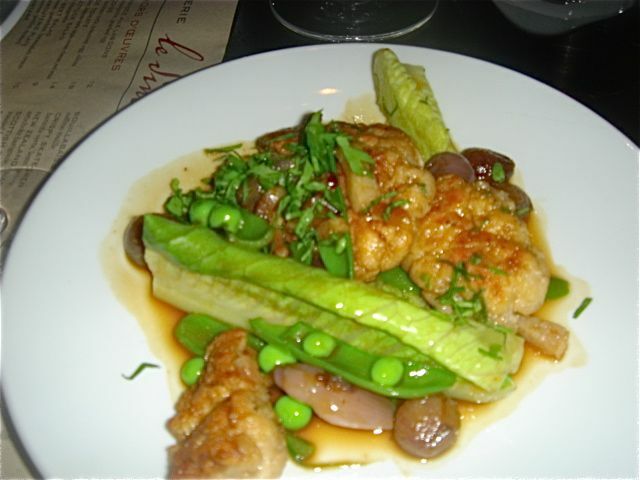 Glazed Sweetbreads, sautéed romaine, peas, lardons, glazed onions – I hope the photo conveys how perfectly the sweetbreads were cooked. N/V Roger Coalon Rose–delightful, light rose color, great flavor, nice drink. 2004 Chassagne-Montrachet Moregot, Henri Clerc, major wine, great deep flavor, superb finish, meyer lemon/grapefruit flavors. 1995 Morey St. Denis, Les Rochots, Arlaud, nice, mature Burgundy, left a little to be desired on the finish. Comme Ca is just such a satisfying meal – no pretension, the execution level of cuisine is consistently excellent, the service is exemplary and if not for the noise level around 9 pm, this would be a perfect restaurant experience. I really, really like Comme Ca – service is extraordinary, the food is excellent, but there is one huge caveat – the noise is deafening. At 7:00 you can have a normal conversation, by 9:00 your ears are ringing. This might be a function of my age – I am not a thirty something or even close to a forty something. 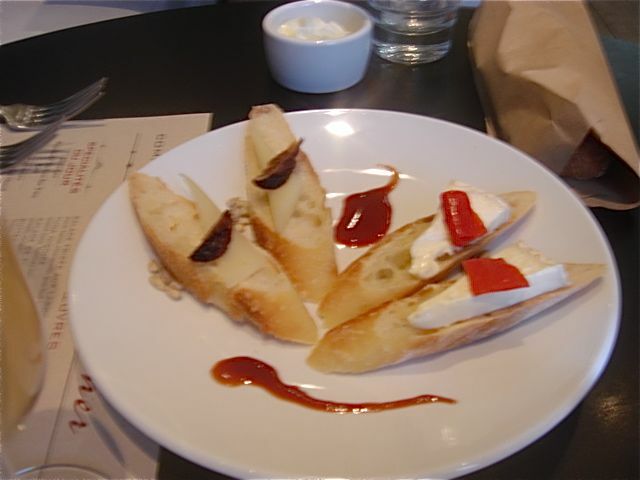 Brad was our server and he did a superior job – attentive plus knowledgeable. The Comme Ca menu is not static – there have been numerous changes re preparations i.e. the smoked salmon galette is now salmon tartare, there is a tomato salad with avocado and triple cream cheese, the Scottish salmon entree is now done with melted tomatoes and béarnaise, the pork chop prep is with Swiss chard and corn, there are 2 types of bouillabaisse – one done with only shellfish that includes lobster and the sole is done with piperade and Manilla clams. I think this speaks volumes about Comme Ca as a restaurant; they could stick with the tried and true, but they are willing and certainly capable of tweaking the menu and adding appropriate seasonal ingredients. Being old foggies, we tend to stick with our favorites. All dishes were splits – one for two and served family style. 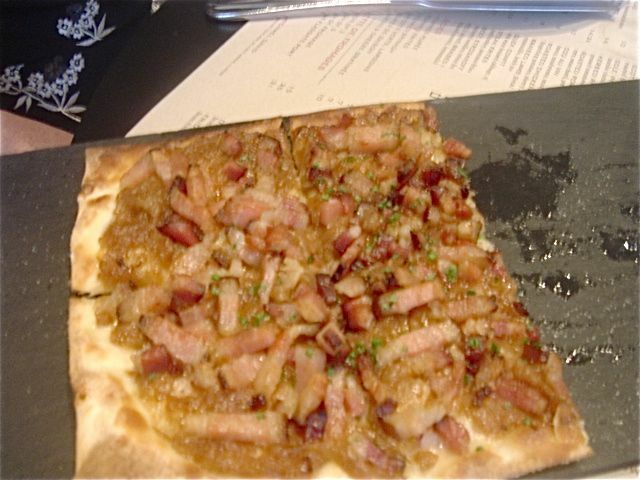 Tarte Flambee with caramelized onions, fromage blanc, lardons – the edges of the tarte were burnt, but we just ignored the edges and the topping itself was flawless. 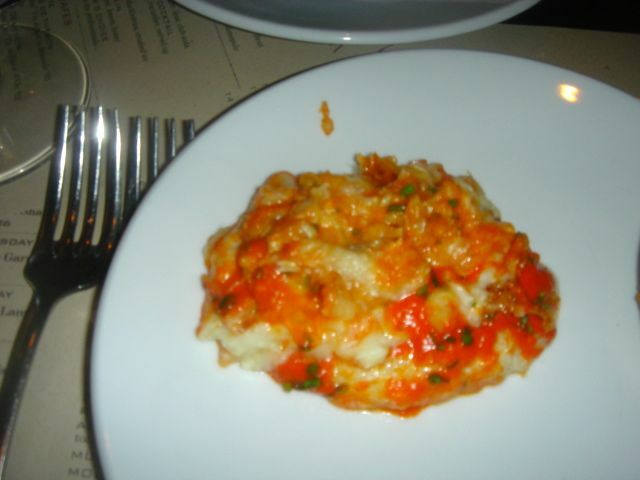 Brandade de Morue Gratinee – salt cod, piquillo pepper puree – this absolutely deserves to be a signature dish at Comme Ca – a dish I just can’t resist. 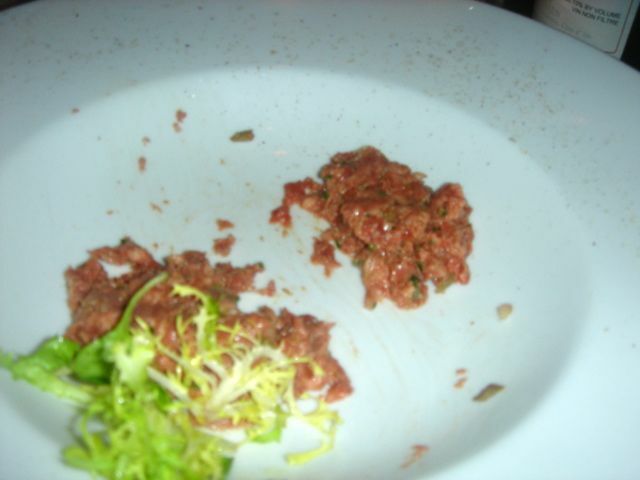 The dish as presented doesn’t photograph as well as the dish plated. 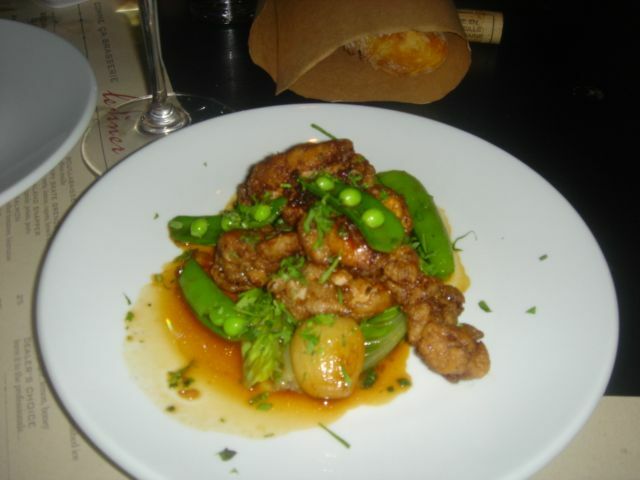 Glazed Sweetbreads, peas, lardons, glazed onions – what more could one ask for? 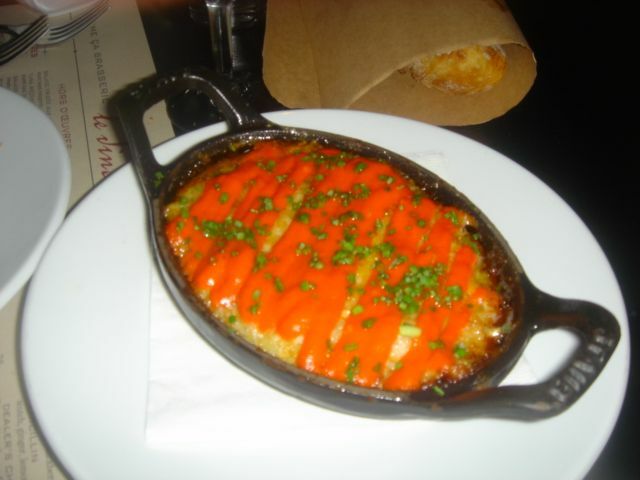 From the photo, my guess is that most of you would vote for Anisette’s version, but look at the dish plated. Anisette’s version was so over-dressed, it was drowning. Roasted Beef Marrow and Oxtail Jam, toast, fleur de sel – excellent, but we were getting full and the noise level was deafening. Serge Mathieu, Cuvee Tradition Blanc de Noirs–typically clean and direct, nice long finish. ’02 Joseph Drouhin, Beaune Clos des Mouches–this is a great white burgundy that I wish I could afford more often. In the old days we bought it by the case. Beautiful light nose, very fruity but not extreme, no oak, clean, full-bodied chardonnay. ’96 Clos Saint-Denis Michel Magnien, Reserve–aged Burgundy, full, rich, good raspberry nose and flavor, long, clean finish. Bottom Line – Comme Ca is doing it right; I just wish there was a way to soften the noise factor. 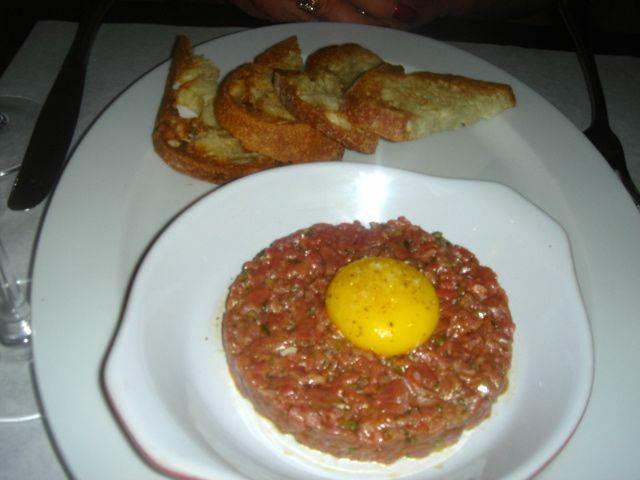 We really like Comme Ca, David Meyer’s French bistro. One caveat – for us, it is better on the early side as by 8:30 the bar is 3 deep and the noise level can be deafening if you are sitting anywhere near the bar. They know our favorite table, even though we have only have been there once before, a small table by the window, but far from the bar! The chef de cuisine at Comme Ca is Michael David who worked both at Café Boulud and DB Bistro Moderne. Our waiter, Andre was superb and we were able to order one course at a time and have a leisurely meal. Essentially we devised our own tasting menu, ordering from the hors d’oeuvres section of the menu. 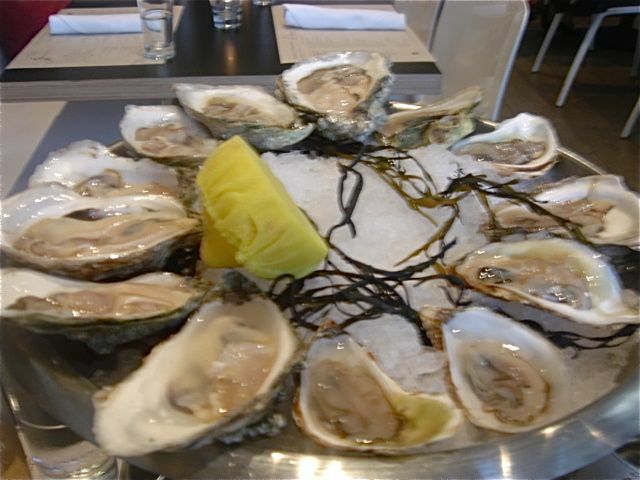 First Course – a dozen oysters – Fanny Bay and Malpeque. 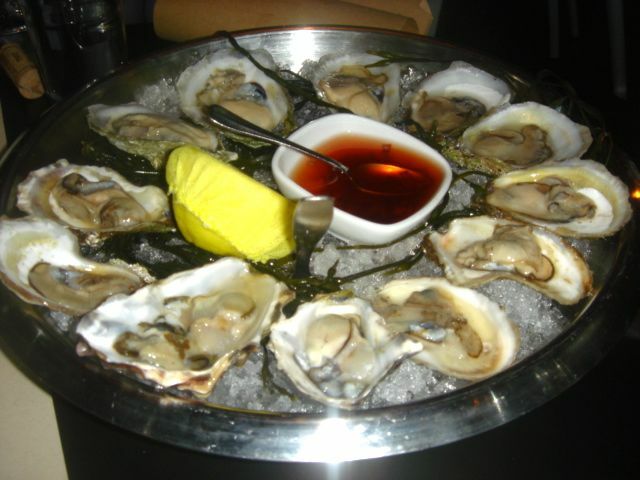 Again, like last time, these are slurping oysters, needing no sauce. Second Course – Scottish smoked Salmon on a shredded potato galette with chive crème fraiche – delicious. 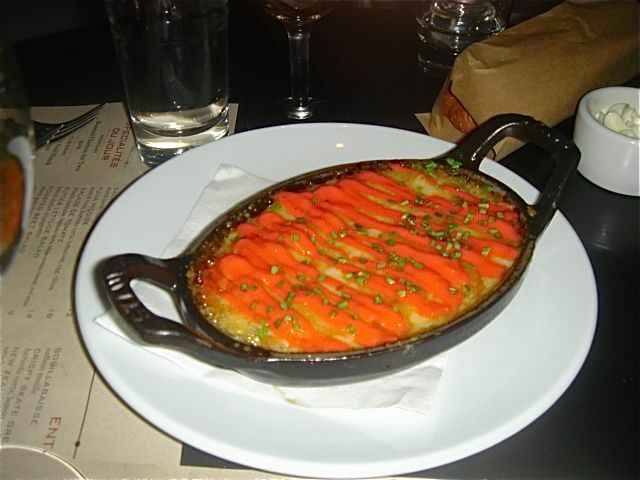 Third Course – Brandade de Morue Gratinee – we had liked this so much last time, we decided to have it again – just as good. Fourth course – Escargots persillade – burgundy snails, garlic butter, parsley – this was poor – way too much parsley, chewy snails – I would not order this again. 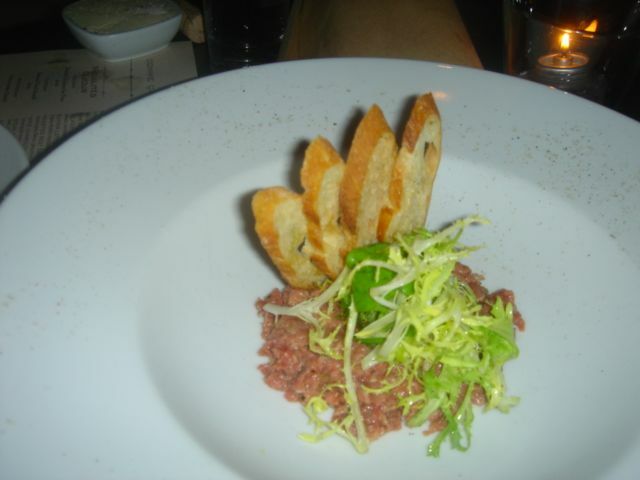 Fourth course – Steak Tartare- hand cut with capers and corrnichons – the tartare was excellent, on a par with Bistro Jeanty’s in Yountville. 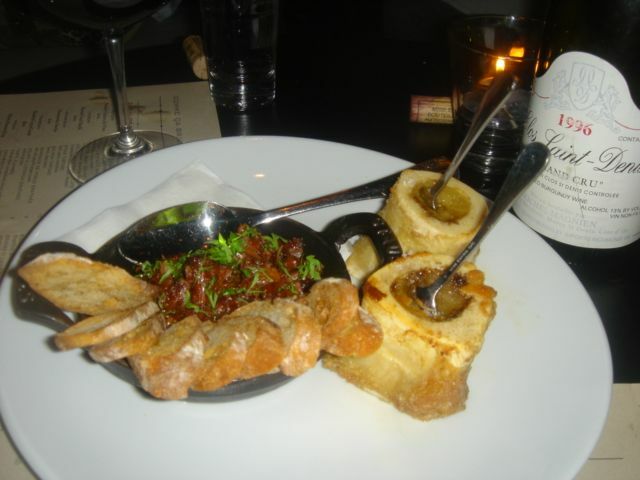 Fifth course – Roasted Beef Marrow and Oxtail Jam (the meat shredded and reduced to a soft tenderness.) The oxtail jam was served in a separate casserole and I added it to the roasted beef marrow.. Another repeat and definitely worth repeating. 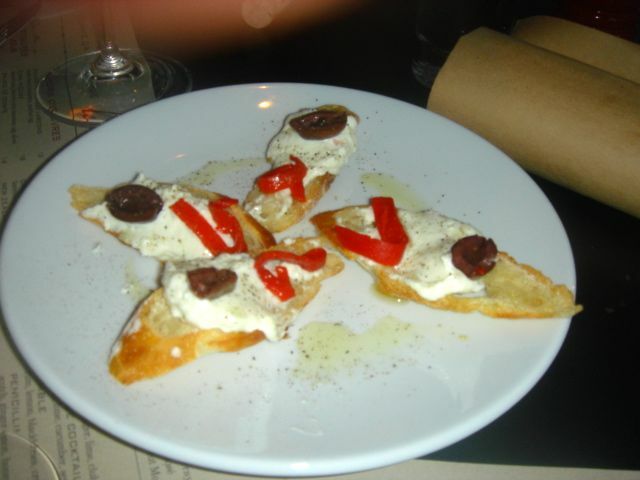 Sixth course – Cheese – no picture and no clue. The sommelier was extraordinary. We had brought a 1998 Chateau Smith Haut Lafitte, Pessac-Leognan. We try very hard not to bring wines on a restaurant’s list. Rory, the sommelier said not a problem at all as they have the 2001 on the list. Well, we shared as always, and a couple of minutes later, Rory arrived with the 2001 and said let’s taste this side by side. The 1998 blew the 2001 away, but we weren’t charged for our glasses of 2001. We both thought what an incredible “going-out-of-your-way” gesture. That is what I would call going that extra mile. 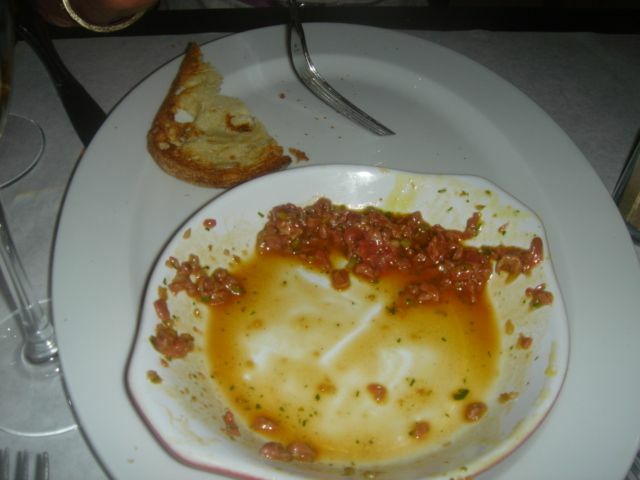 We will definitely go back for a third visit as there are many items on the menu that I want to try i.e. the glazed sweetbreads, the mussels and the duck confit to name a few.